This year I did not have room in my box to plant a zucchini because the beets took longer than usual. My boss heard this and said that he had two zucchini plants and he would gladly give me one. So on June 29 Mr Zucchini joined the community garden in the spare box. Some of his leaves died out, but I watered him everyday and he has sprouted new leaves and a flower. 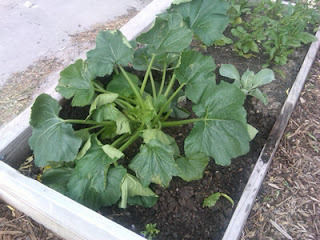 Here is Mr Zucchini on July 7. 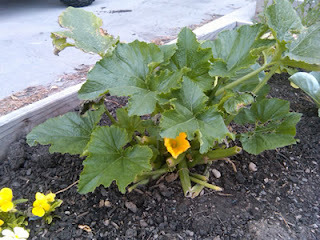 I hope to get a zucchini soon----Mr Bee needs to do his work!